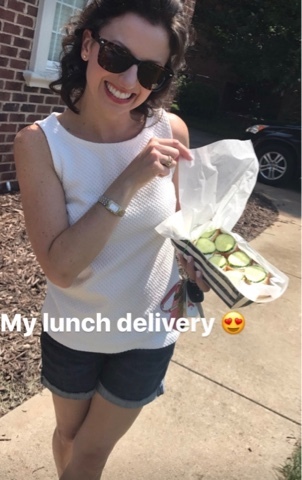 My girlfriend snapped this photo of me and put it on her Instastories yesterday and had some people asking for the recipe of the cucumber sandwiches I made her! It is so easy that we don't really even need a recipe. You will cut several pieces of white bread in quarters (4 squares) with a pizza cutter ... and trust me on this -- my girlfriend can attest to it -- use Sarah Lee Artesano bread! Note: I usually use a juice glass or round cookie cutter to make the bread in circles, but I was tight on time yesterday so simple squares won out! Slice a seedless cucumber very thinly into rounds. Let these rounds dry on a paper towel. Mix up half a block of softened (light) cream cheese with equal parts mayonnaise, and then season to taste with garlic powder, salt, and pepper. Add in lots of dried dill. Make sure it is nice and spreadable. Top your white bread square with the cream cheese mixture and a cucumber slice. It's that easy! It's like a little open-faced poppable cucumber sammie. These are so refreshing and light for summer, and they also make a great party or baby/wedding shower hors d'oeuvre. July 4th is around the corner, and we have our American flags ready! 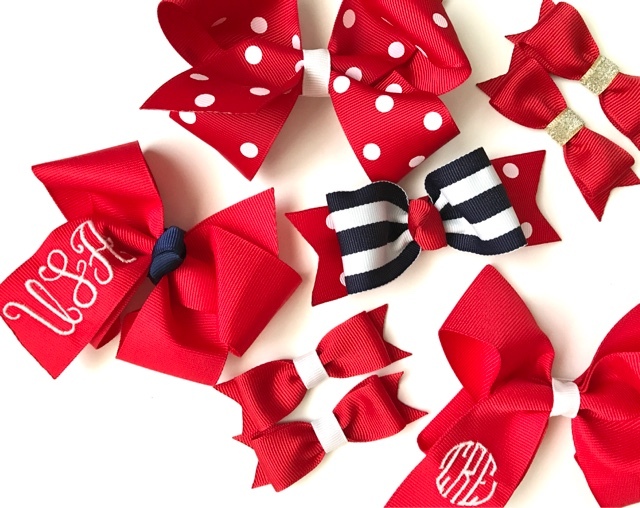 The girls' outfits are selected (of course) and I've also been very busy making hairbows for some local sweethearts. 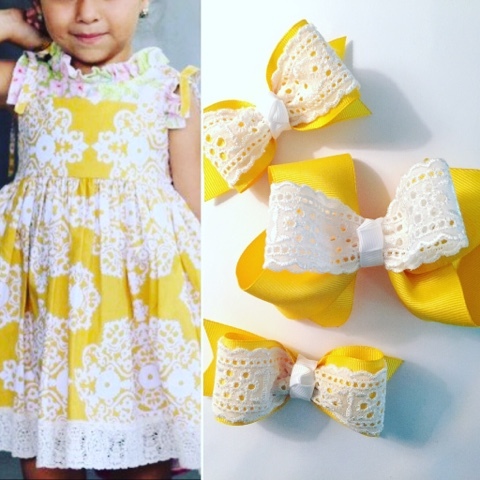 I still love making these and the little piggytail bows shown below have been a big hit! A set of two is $8. And of course I have so many other items on my wishlist. (whoops) But I keep rewarding myself after lots of sales with little makeup treats! 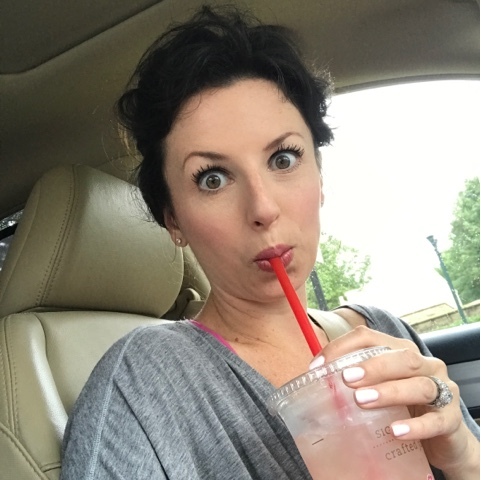 The pic below shows me wearing the foundation, the eyeshadow in Smoked Topaz, and the LipSense in Pomegranate. That RapidLash is really kicking in now after 2+ months! Know what's really good?! 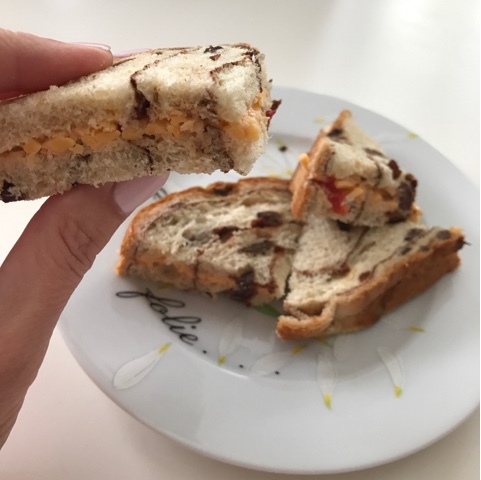 Pimiento cheese on cinnamon raisin bread! 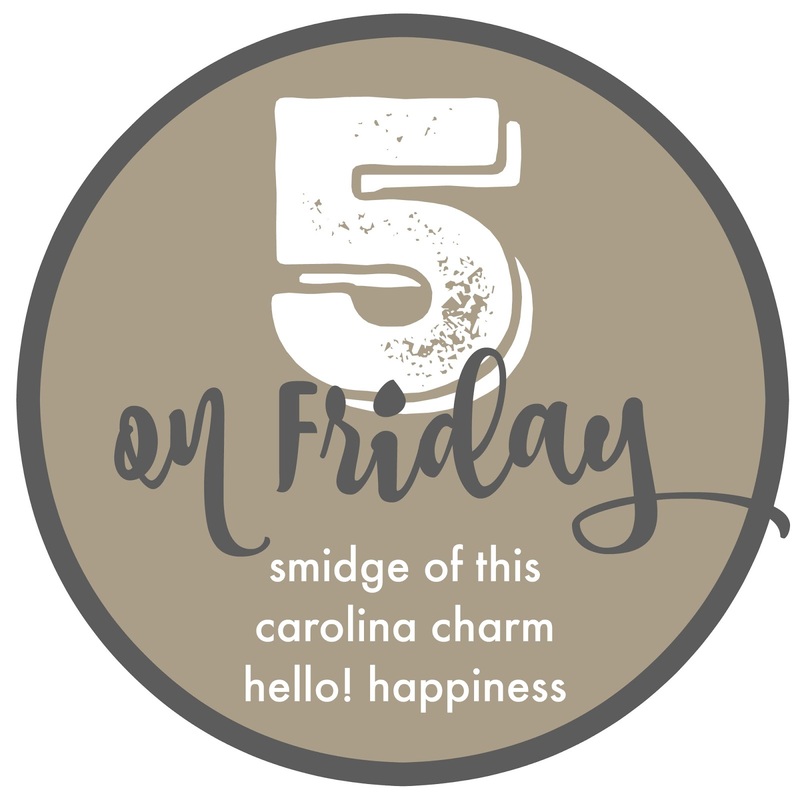 Palmetto Cheese is our go-to brand. 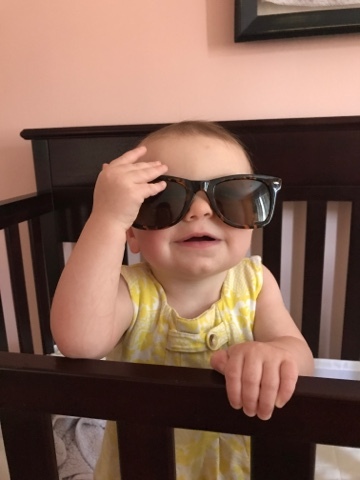 Charlotte discovered the joy of Mommy's sunglasses yesterday. 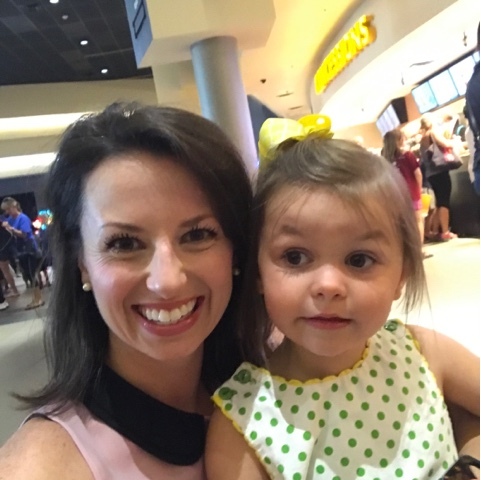 This child is PURE SWEETNESS and I can't get enough of her smile! She also has those smiley eyes that go into half-moons when she smiles and laughs which is the best thing ever. I love my girls! For some of you, this might be a seriously l-a-m-e post, and others of you might find it to be an idea you want to try. So this is one of those 50/50 posts. 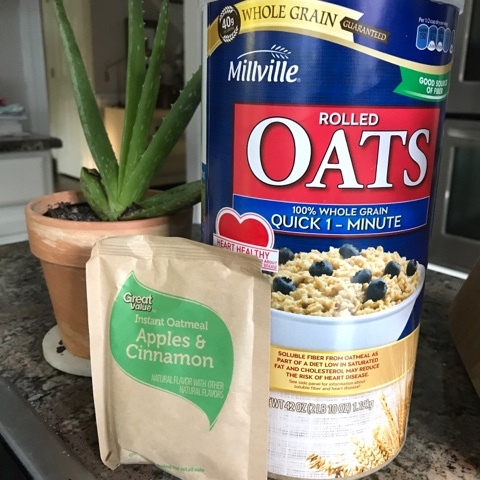 Let's talk about oatmeal. 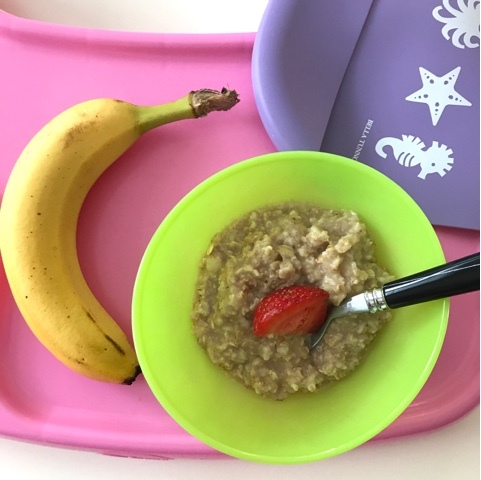 The girls really like oatmeal in the mornings and I keep it easy with quick prep oatmeal that I can make in the microwave. Camille's favorite is the apple & cinnamon flavor. Char loves every kind of food so she's cool with that too. 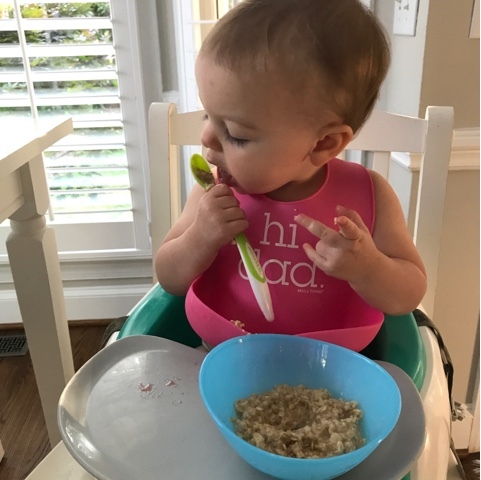 But I just didn't feel right about giving Charlotte the full sugar instant oatmeal. SO, I mix equal parts of unflavored, unsweetened rolled oats along with the apple & cinnamon packet, mix in water, and heat for a minute. Done! Split between two bowls. 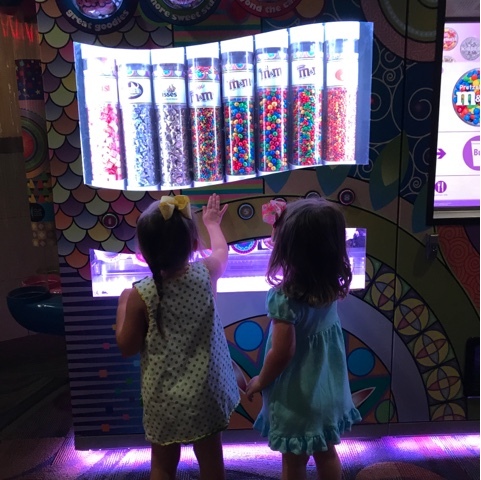 It cuts the sugar in half, and the girls are none the wiser. 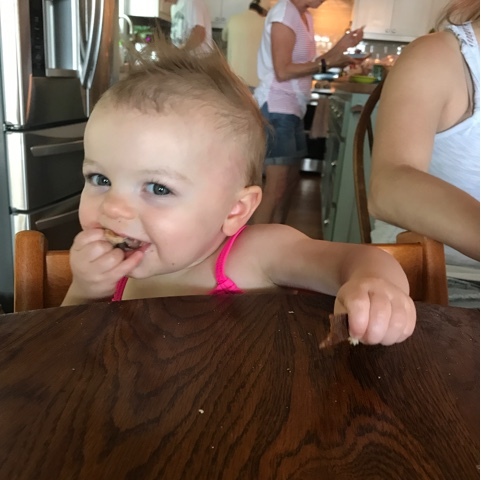 My little monkeys eat a banana every single morning ... we are keeping Chiquita rolling over here. 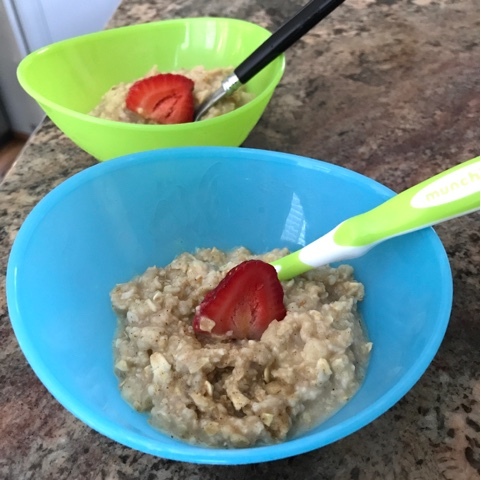 So, while I know the BEST case scenario would be to have them eating some sort of steel-cut oats with flax and chia mixed in, I'll take this as a win for now because a serving for them now has 50% less sugar. It's the small victories, folks. 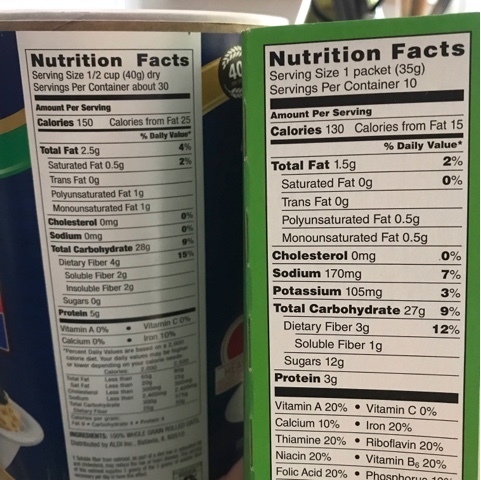 Zero grams sugar on the left, 12 grams sugar on the right, so their bowls each contain 6g of sugar. Yesterday I asked for suggestions about an all-American supper that I could fix for my husband's cousin while he was here in town. 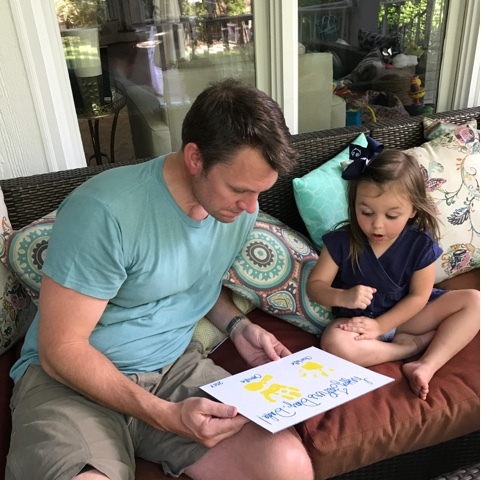 He is stationed at a military base near Nashville, and he likes to stop at our house for a night on the long drive home to visit his family in DC. 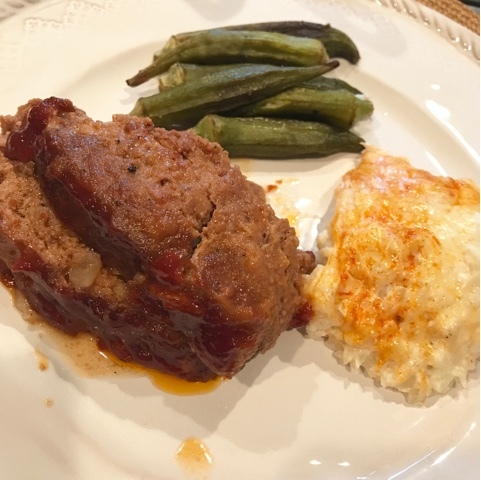 I ended up making meatloaf with roasted okra and mashed cauliflower! Y'all it was SO good. A nice home-cooked meal that was also easy to prep beforehand. Ian said to me this morning, "You are welcome to make that meatloaf ANYTIME you want." So, the meatloaf recipe can be found HERE and the only change I made (I learned this trick from my mama) is that I subbed the apricot preserves for orange marmalade in the glaze. And it's fabulous. I've blogged before about the mashed cauliflower HERE but I have a newfound shortcut that I love. I now use the frozen bag of steamable garlic cauliflower. I buy 2 of the bags for this dish. I throw each bag in the microwave for 6 minutes and that is it! Mash it with the cream cheese, mozzarella, and seasonings and you're set. Top with cheese and bake. And for the okra, I also started with frozen okra! I thawed it over the sink and let the okra dry. I tossed it with olive oil, salt and pepper and roasted it on a foil-lined baking sheet until they were nice and roasty brown. If you are looking for a super satisfying meal that will remind you of your mama or grandma's house, I highly recommend this combo! Tuuuuuuesday, and we are excited this morning because Camille is going to her first day of dance camp! The theme? Trolls! They will dance to the songs, do Trolls-related arts and crafts, and just have the time of their lives. I can't wait to hear her recap today at lunch. Tonight we are hosting my husband's cousin as he makes his way from his military base to his home. I need to run to the grocery store in a bit and I'm looking for some great all-American dinner recommendations. He always raves about my cooking which makes me feel WONDERFUL. In the past I have made ribs for when he's been here and that was such a hit that I might do it again. The only caveat is that he and Ian both eat low-carb so no rice, potatoes, breads, etc. -- I'm planning one meat and two veggies. SUGGESTIONS ... GO! Lastly, congrats to the winner of the Ja-Vie flats! I will email you -- congrats! 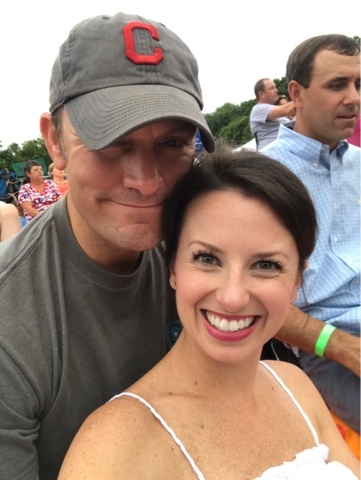 Last night we went with three other couples from our neighborhood to Pops In The Park. 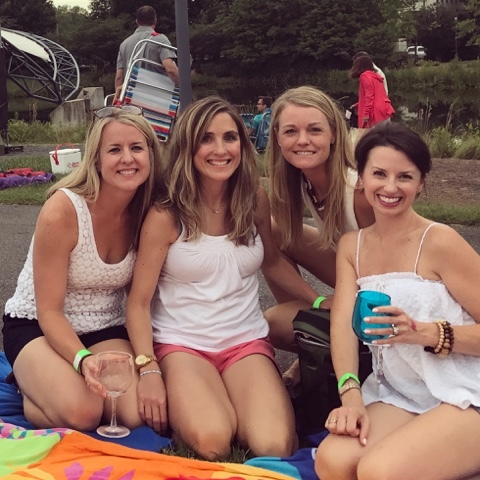 The Charlotte Symphony plays outside five times during the summer and you are invited to throw down a blanket, pour a beverage, slice up some cheese and salami, and chat with friends and blanket neighbors. The theme last night was Broadway and we had a fantastic time with our neighbors who have all become such great friends. I LOVE OUR NEIGHBORHOOD! 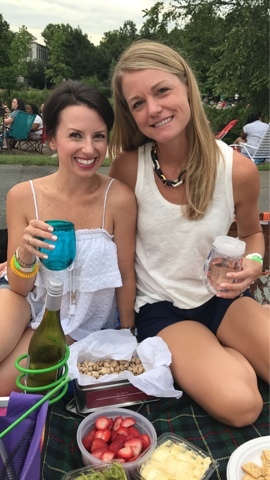 This is truly one of my favorite events to attend here in Charlotte and we are so lucky to have such a talented Symphony. Reminder: today is the last day to enter the giveaway for the pair of Ja-Vie flats! Click here to get your entry in! 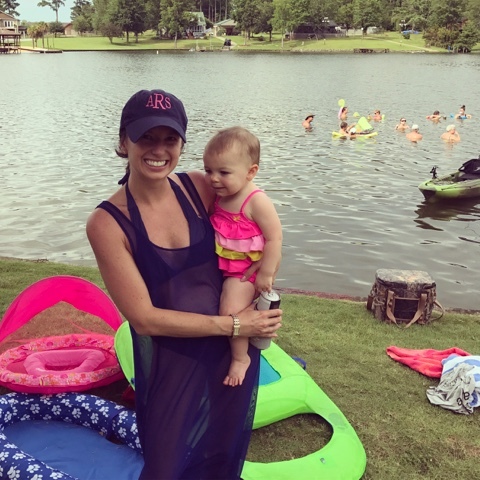 Yesterday I hit up the local (Matthews/Stallings) splash pad with the girls and it was so cute! Camille was super timid at first and would not go into the water. 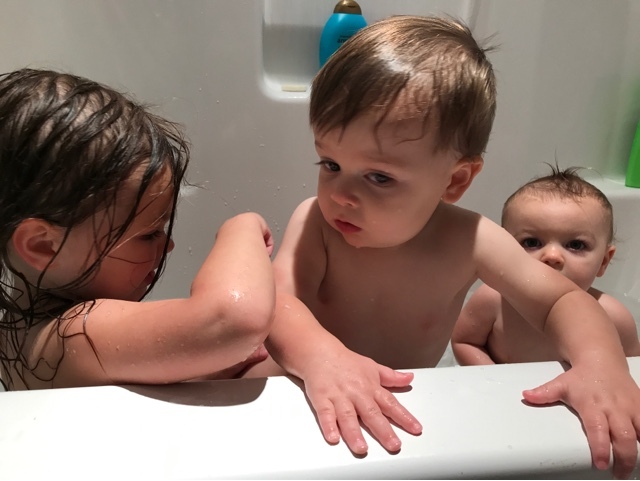 There were lots of older kids and LOTS of water was spraying out all over ... I could see how it would be intimidating. But she warmed up to it and had a great time! 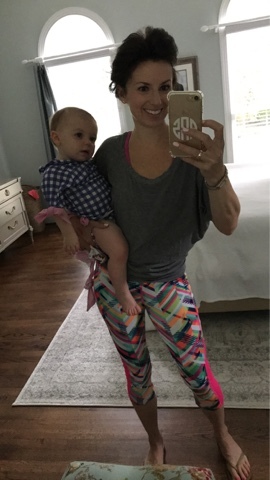 I posted this pic on Snap before we left and got questions about my workout pants -- they are cheapies from Walmart! The brand is Avia and I'm unsure if they are still available (they are a few months old) but I bet they have something comparable. They come up fairly high on my waist which is nice and even have a hidden inner pocket. 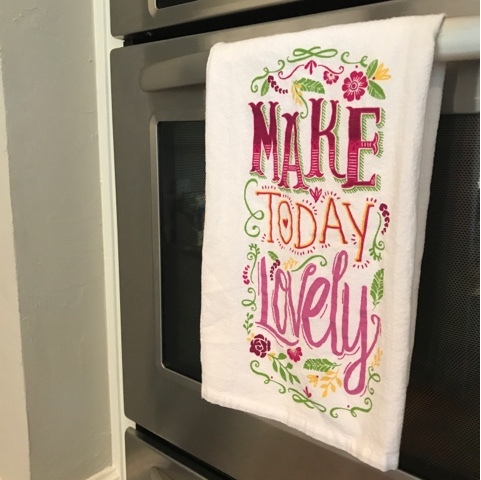 Speaking of Walmart, I picked up this adorable flour sack kitchen towel there the other day for less than two bucks! It looks perfect in our happy kitchen. I recently received samples from The First Years and wanted to brag on them a little bit here. 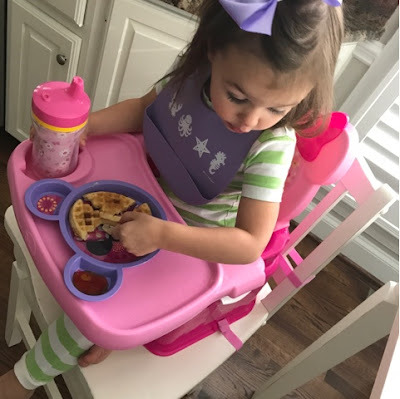 They sent me the Minnie Mouse Helping Hands Feeding & Activity Seat which can be purchased at Walmart (okay, first three posts today all about Walmart, I promise they are not paying me!). 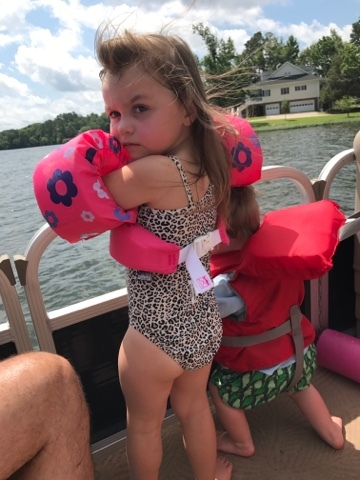 I thought it would be better suited to Charlotte's size but Camille (at 3 years old) quickly called dibs and it's now hers forever. She loves it. She can crawl in/out of it herself and just needs help with the tray. 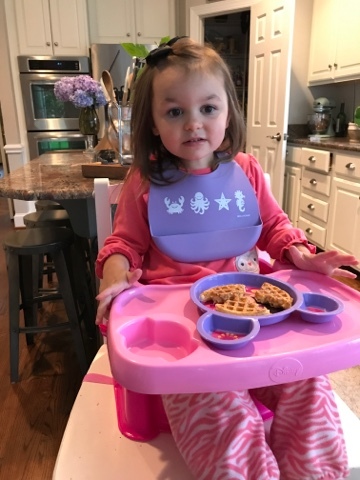 Comparing it to the Bumbo seat that we have, I'd say the main difference is the tray. To me, there is a pro and a con to it. 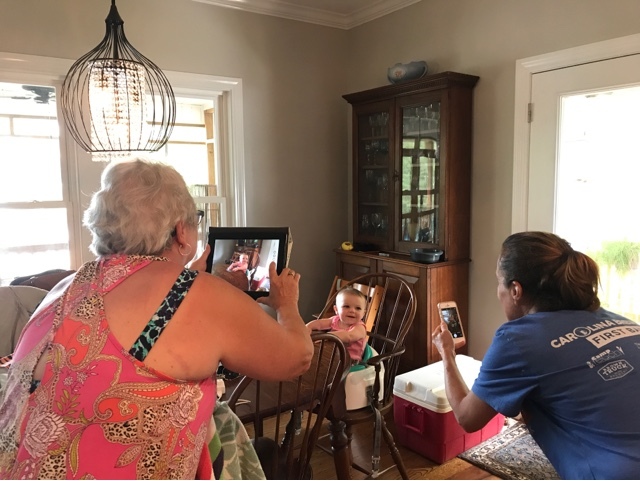 The con is the it is harder to snap on then the Bumbo we have. The pro is that there are no inner chambers that can trap moldy, mildewy water. It is so easily cleaned and disinfected. So, that is a HUGE win to me! The cupholder is also really helpful to prevent spills. 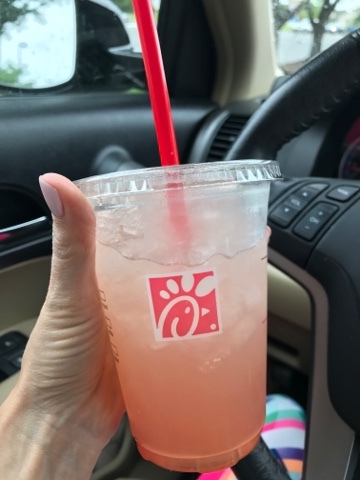 My girlfriend Sarah alerted me to the watermelon mint diet lemonade at Chick Fil A and man oh mannnnn is it tasty. I'll take this over a Starbucks drink any day. 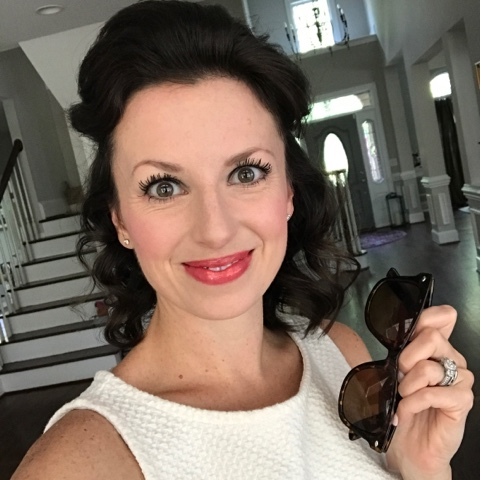 I posted a Facebook Live video on my Smooch By April page and referenced an eyelash growth serum that I have been using and loving. I started using it right when I weaned Charlotte from breastfeeding (per my pediatrician's recommendations ... check with yours, obviously!) so have been using it regularly for about 2 months. I'm really seeing a great difference! I swipe it on my lashes and brows at nighttime. I've used Latisse in the past but this is a FRACTION of the cost and is Amazon Prime eligible, soooooo .... yeah. It's amazing. 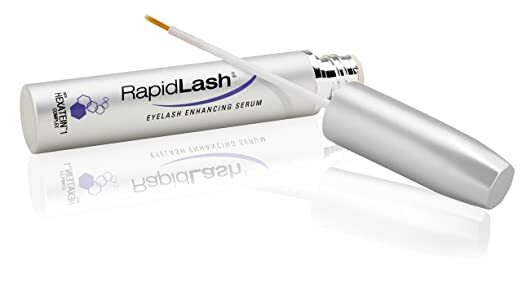 It's called RapidLash (available here) and I read several reviews on it before buying. Good stuff! Yesterday was the first day of summer! Hooray! 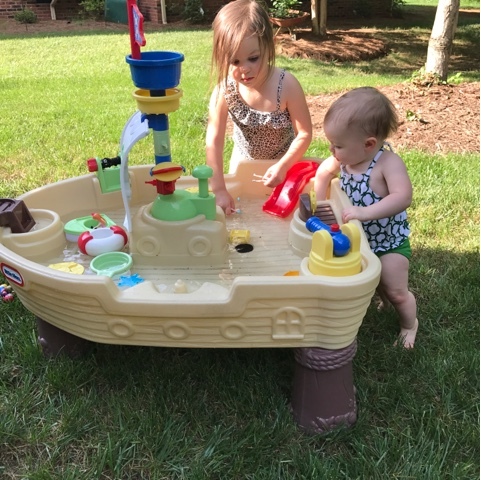 Bring on beach trips, popsicles, and all things nautical! A girlfriend complimented my new lobster kicks the other day and I have to admit I think they're pretty swell, too. 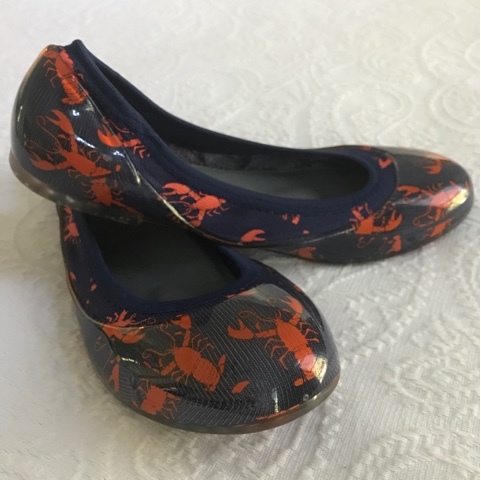 Navy Ja-Vie flats with orangey-red lobsters on them! I love! 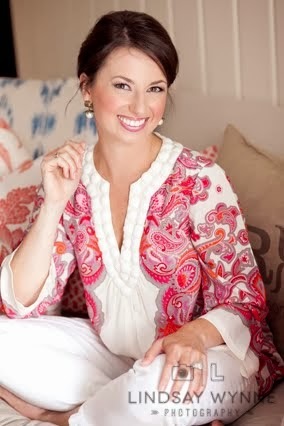 I reached out to the lovely folks at Ja-Vie and they agreed to a giveaway here for all of my wonderful readers! Comment below for a chance to win a pair of your choice! You know I love sharing a GOOD thing with all of you. COMMENT BELOW with the pattern or color from their collection that you would choose. You can see the designs HERE on their website or on their Instagram (@javieflats). Please include your email address in with your comment. Giveaway runs now through Monday at midnight, Eastern time. Winner announced Tuesday! Good luck! This past weekend we stuffed nineteen people and four dogs into my parents' lakehouse. And it rocked. 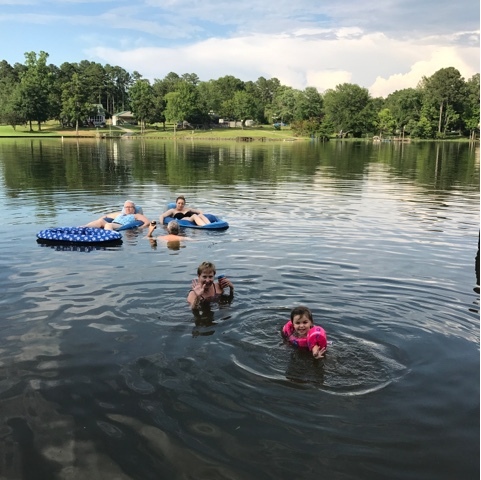 Now, three of those folks were wee ones three and under, and we also have a teeny cabin onsite where a few people stayed. And my cousin and his wife slept in their tent, and my aunt and uncle brought their pop-up camper. I should have taken photos of it -- they bought it and gave it an "extreme makeover" and it is FABULOUS. SO everyone slept pretty comfortably! Thursday night we just goofed off with each other and waited for some of our other family members to arrive to town Friday. 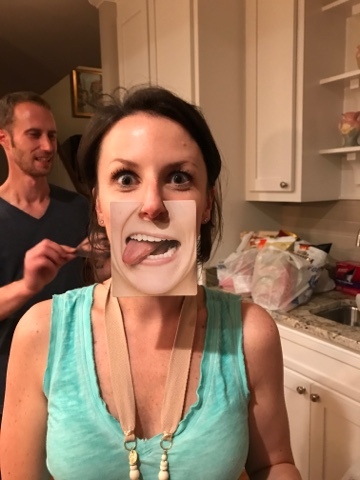 By the way, check out my cousin Ben in the background below. Prince William perhaps?! We think they look really similar. Friday we just had a relaxing morning and spent lots of time on noodles and floats in the water. That night was THE. MOST. FUN. 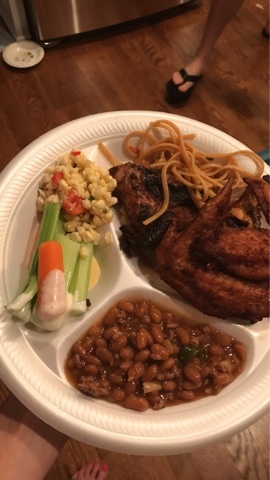 We call Friday night of this annual get-together "Wing Ding" because the guys have a chicken wing cook-off. This year the chefs were two of my uncles and Ian. Ian actually makes amaaaazing wings. All of the wings that night were delicious. The most fun part of the night was that we broke out KARAOKE after supper on the screened porch and we sang our hearts out until midnight! All 16 of us adults. I have a horrible, horrible, horrible creaky off-pitch southern twang voice but I sang two Adele songs like I.was.actually.her. (the trick to karaoke is owning the heck out of the song you choose). I sang with Ian, I sang with my aunts, I sang with my sisters, I sang with my cousin Ben, it was sooooo much fun. We used a free Karaoke app on my Dad's iPad and two wireless speakers and an amp. It was wonderful. Saturday we took a post-breakfast boat ride (and an advil)! 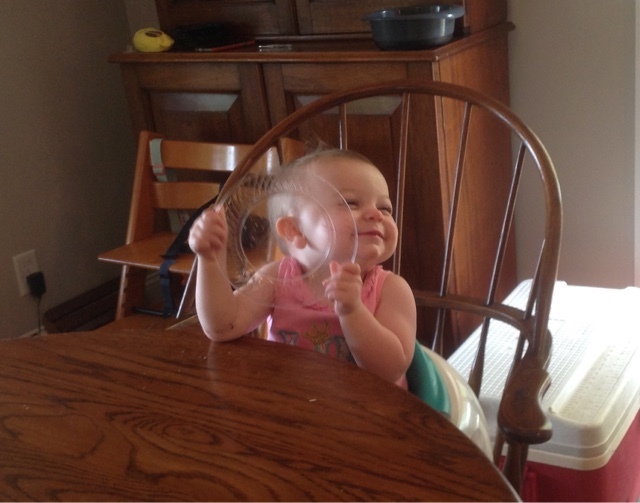 And later Charlotte started her smoosh-face trick again after lunch which was SO funny. 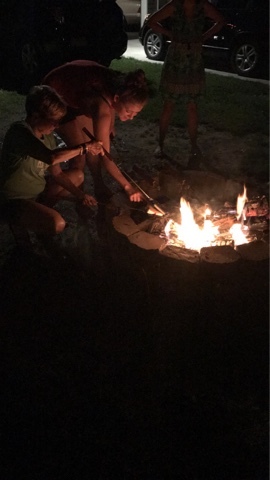 After a supper that night of pulled pork, vidalia onion pie, green beans, tomato pie, we played Left Right Center and my cousin's wife Jennie showed us how to make camper pies. 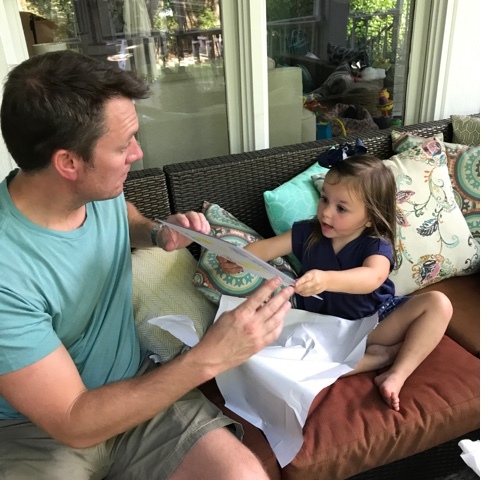 Sunday was Fathers Day. 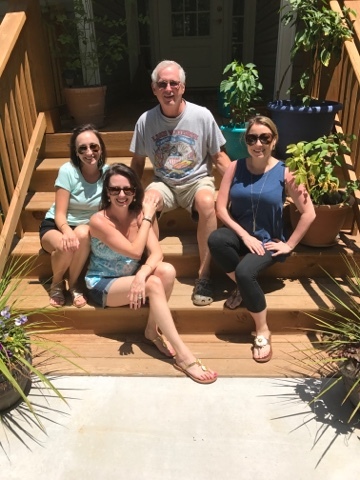 After we headed home, we grilled out hot dogs as a family and enjoyed dinner on the screened porch. 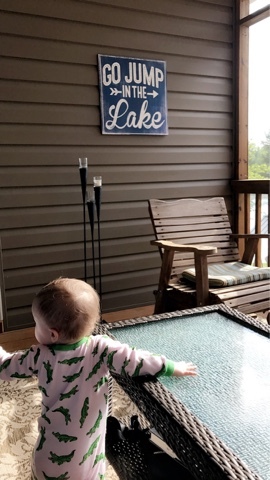 We are already trying to figure out our next lake trip. 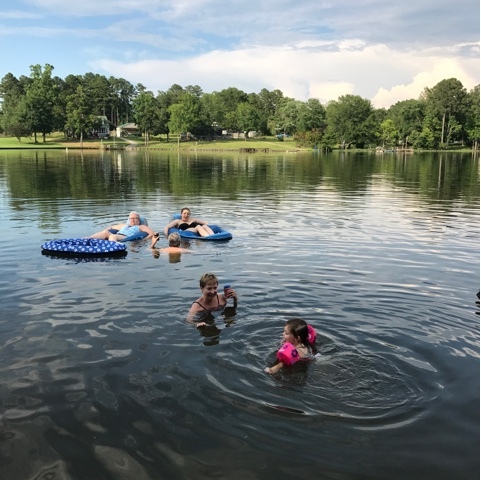 Lake living is good living. 1 // snapchat or instastories? 2 // thoughts on this mermaid hair trend -- dyed pink, blue, mint? 3 // do you drink sweet tea? 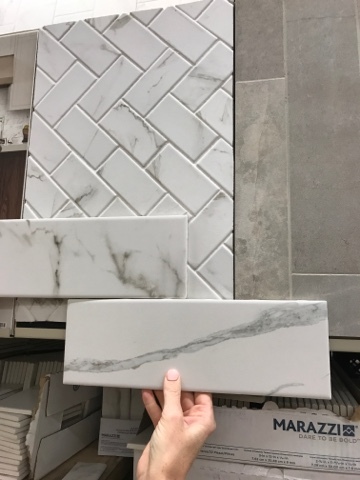 I am so excited about an upcoming bathroom renovation we are planning! We are going to be starting demo later this month (hopefully) and I'm equal parts nervous and excited. We have a firm budget in place and are trying to achieve a beautiful look without just throwing gobs of money at the situation (which is obviously easy to do). I'll post updates here as they are available! Oh my gosh guys, guess what I did yesterday. I was prepping to go out of town this weekend and bought a fun bottle of rosé at the grocery store. They put it in a brown bag and I packed it in my trunk along with all of the bananas, snacks, and lunch ingredients. Drove three minutes home, opened the trunk and POPPPPP the bottle rolled right out of the trunk and shattered into pieces on the garage floor. Ever had that happen? Face palm. 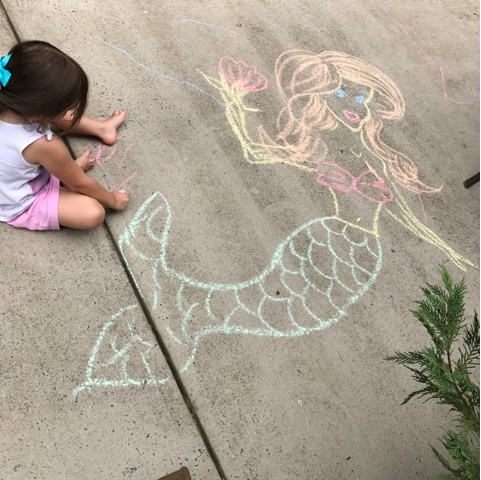 We are loving summer fun activites around the backyard! 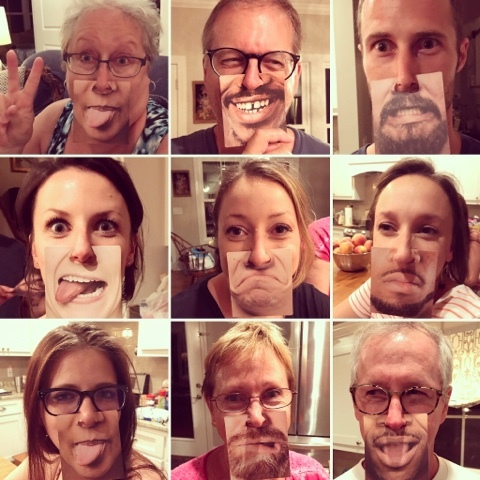 I love my crazy family and these fun coasters! 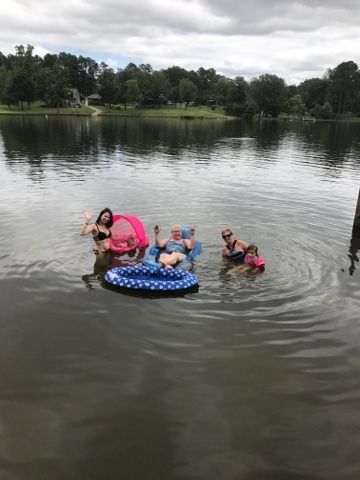 Finally, hey from the lakehouse! Hence the later post this morning. 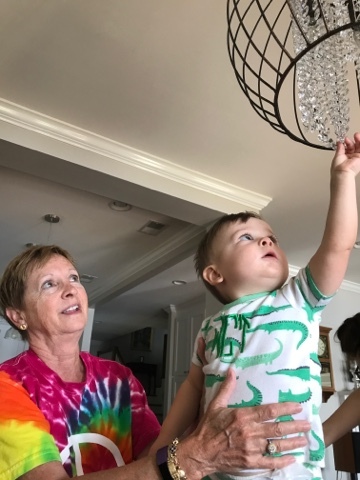 We are having fun with my mom's side of the family.